Box contents- Belling Kensington 100E Electric Ceramic Range Cooker. 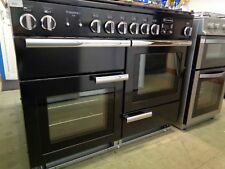 TypeFreestanding electric range cooker. Oven type- Main: electric. Hob typeElectric ceramic. Second oven shelves- 2 shelves. Third oven shelves- 1 shelf. (This item is dented towards the front on the right side (see Pictures). Beko DIN1510imple as a table top, our team does the very best we can to provide the information and support you need. 1.9) If you are worried about your drive way or flooring inside of the property it is your responsibility to make sure it is covered with a protective sheet or inform us before we arrive. WIDTH 90cm. BOTTOM LEFT OVEN CAPACITY 64 Litre (Fan Oven). RIGHT OVEN CAPACITY 91 Litre (Fan Oven). FUEL TYPE Induction. TOP LEFT OVEN CAPACITY 33 litres (Grill). DEPTH 600mm. Scotland (Aberdeen, Dundee, Falkirk, Outer Herbrides, Inverness, Kirkwall, Paisley, Perth, Galashiels, Shetland Islands) Ireland, Northern Ireland, Channel Islands, Isle of man, Isle of Wight and the Isle of Skye and Ireland. Fanned main oven in upper right. Conventional electric second oven in lower left. 2/2 shelves in main/second oven, with 5/5 positions. Separate electric grill cavity in upper left, with grill pan. Ease of use 9.0/10. The Belling 90Ei Cookcentre Electric Induction Range Cooker has a stylish contemporary look which would look stunning in any kitchen. Market leading tall oven equipped with 91 litres of capacity and 25 shelf positions on 90cm models. (A) All of our products are NEW they have never been used on even switched on! Unlike others, we buy in bulk therefore we can pass these savings on to you! Q) What if I change my mind?. Best Wishes From. ISLE OF MAN £ ASK. 100% Genuine. Fair Pricing. BELFAST BT £ ASK. DUBLIN IE1-5, 7-26 £ ASK. DUBLIN IE6 £ ASK. AB, DD, IV1-28, 30-32, 36, 40-49, 52-56, 63, KW1-3, 5-14, PA21-38, 41, PH1-26, 30-41, 49-50 £ ASK. 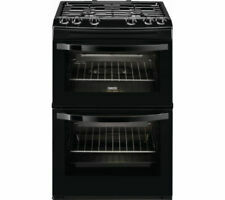 Model BEL COOKCENTRE 90G Blk. Also known as: 444444077, Cookcentre 90G Black. 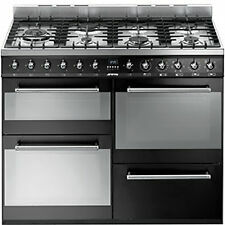 Type 90cm Gas Range Cooker. Function Conventional Gas Oven. Hob Type Gas. Function Variable Rate Gas Grill. Oven Light Yes. Belling FS50EFDO Free Standing 50cm 4 Hob Single Electric Cooker - White. 4 Induction zones warming zone. Main fan oven in lower left. Tall fan oven on the right. Programmable main oven. 2/3 shelves in main/second oven, with 5/25 positions. Separate grill cavity in upper left, with grill pan. 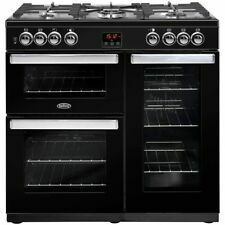 Belling Cookcentre 90Ei Free Standing 90cm 4 Hob Electric Range Cooker - Black. Box contents Belling FS50ET 50 cm Electric Cooker. HOB Griddle Dials. 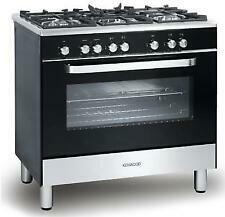 OVERVIEW Type Freestanding electric cooker. Hob type Electric solid plate. Fuel Electric. Oven type Electric. GRILL Grill type Separate full width electric grill. Box contents - Belling FS50ET 50 cm Electric Cooker. Scotland (Aberdeen, Dundee, Falkirk, Outer Herbrides, Inverness, Kirkwall, Paisley, Perth, Galashiels, Shetland Islands) Ireland, Northern Ireland, Channel Islands, Isle of man, Isle of Wight and the Isle of Skye and Ireland.